As of March 2008, 11.9 million undocumented immigrants were living in the United States. This represents an increase since 2005, when the Pew Hispanic Center estimated there were 11.1 million undocumented immigrants in the country. The number has risen by more than 40% since 2000, when it was estimated at 8.4 million. The estimate of unauthorized immigrants in 2007 appears to be larger than the estimate for 2008, but this difference is not statistically significant. The estimates are derived from sample surveys and thus are subject to uncertainty from sampling error, as well as other types of error. Each annual estimate of the undocumented population is actually the midpoint of a range of possible values that could be the true number. Although it is sometimes difficult to infer magnitude or direction of any single year-to-year trend, intervals based on estimates of sampling error allow some conclusions to be drawn about changes over time. 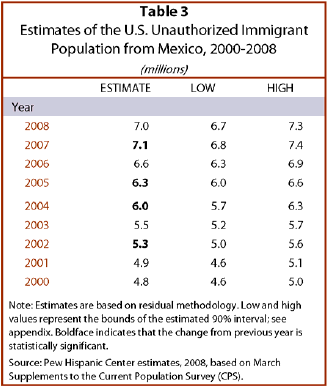 The series of annual estimates in Table 1 and Figure 1 show that the overall undocumented population has increased since 2000. For half the years of this decade, it can be concluded that the unauthorized population grew during the previous year, but for the rest, the apparent change in size of the unauthorized population is not statistically significant. Looking at two-year periods, the apparent change between 2006 and 2008 is the only time this decade that there was not a statistically significant increase. Although the undocumented population has been rising, its net growth has slowed substantially since 2005, compared with earlier in the decade. From 2000 to early 2005, the unauthorized immigrant population grew by an annual net average of about 525,000, increasing to 11.1 million from 8.4 million. Using information on date of arrival, the Pew Hispanic Center estimates imply that during those years, an average of 800,000 new undocumented immigrants—both border crossers and visa violators—entered the U.S. annually. Since 2005, the growth patterns have changed substantially. From 2005 to 2008, annual growth has averaged only 275,000 as the undocumented population grew from 11.1 million to 11.9 million. The estimates of unauthorized immigrants by period of arrival imply that new annual arrivals averaged 500,000 over the three-year period, with a substantially smaller number arriving since 2007. The undocumented population is not a fixed group of people. Over time, some immigrants enter the unauthorized population and others are subtracted from it—by leaving the country, converting to legal status or dying. The methodology behind these estimates does not produce definitive estimates for each of these components of change. This decreasing inflow of undocumented immigrants, which occurred during a period when legal immigration has been relatively steady, has had a hand in reshaping the composition of the nation’s new foreign-born population. A decade ago, newly arrived unauthorized immigrants began to outnumber newly arrived legal permanent residents. The reverse now appears to be true. 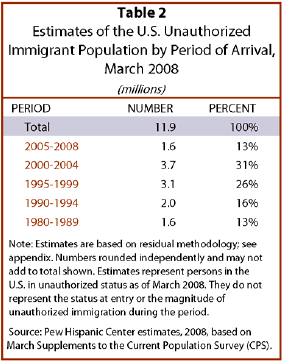 Over the 1998-2004 period, the inflow of undocumented immigrants exceeded arrivals of legal permanent residents. From 2005 to 2008, about 1.6 million new undocumented immigrants arrived (an average of 500,000 a year), compared with 2.1 million legal permanent residents (an average of 650,000 a year). Examination of the annual estimates points to 2007 as the year the turnaround occurred. The growth of the undocumented population may have slowed, but unauthorized immigrants continue to make up a notable share—30%—of the nation’s foreign-born population of more than 39 million people. The unauthorized immigrant population is dominated by recent arrivals—44% came to the United States in this decade. 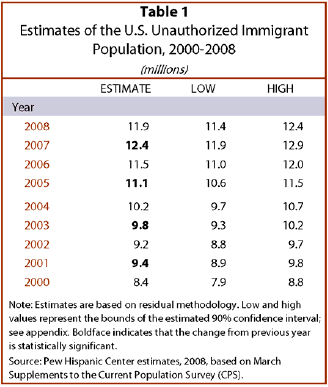 Of those, 1.6 million, or 13% of all unauthorized immigrants, arrived from 2005 to 2008. The other 3.7 million, or 31% of the undocumented population, came to the country from 2000 to 2004. A slightly smaller share, 43%, includes longer-term residents who arrived during the 1990s. Of the 5.1 million who arrived during that decade, 3.1 million came from in 1995 to 1999, when immigration rates reached their modern peak. An estimated 1.6 million undocumented immigrants, 13% of the total, remain as undocumented residents since arriving in the 1980s. The population of undocumented Mexican immigrants has grown markedly since 2000 but appears to have leveled off since 2007. There were 4.8 million unauthorized Mexican immigrants living in the United States at the time of the 2000 Census and 7 million in March 2008, according to the Pew Hispanic Center estimates. Inflows from Mexico have varied considerably in the past 15 years, peaking around 2000, dropping dramatically in 2002 and 2003, and increasing somewhat after that. The slowing growth of unauthorized Mexican population in accord with a number of other indicators suggests a lessening of immigration from Mexico since mid-2006. Undocumented immigrants remain a large majority of new Mexican immigrants arriving in the U.S., with 80% to 85% of Mexicans who have been in the U.S. for less than a decade being unauthorized. Among all foreign-born Mexicans in the country, more than half (56%) are estimated to be unauthorized. Immigrants from Mexico account for a majority (59%) of all unauthorized immigrants in the United States; no other country makes up even a double-digit share. 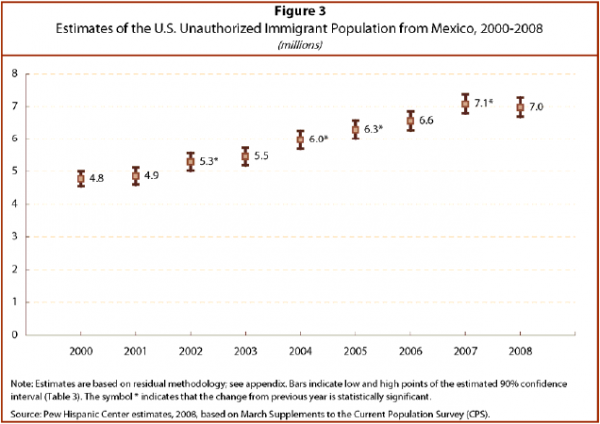 The Mexican-born share of all undocumented immigrants remained essentially unchanged for more than a decade. Among U.S. residents of Mexican ancestry, most were born in the United States. Four-in-ten are foreign-born. 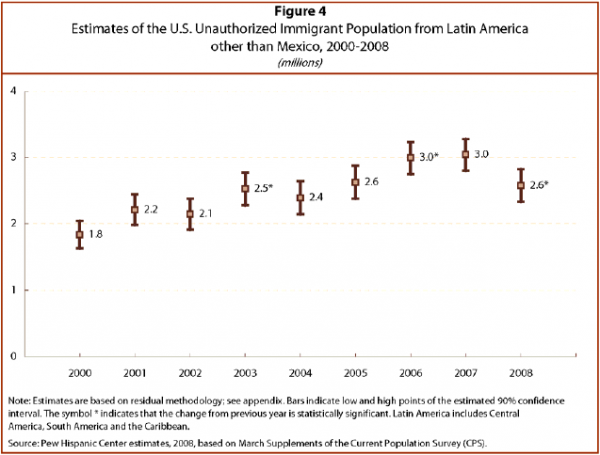 The number of unauthorized immigrants in the United States from Latin American countries other than Mexico grew by more than 40% from 2000, when there were 1.8 million, to 2008, when there were 2.6 million. This population reached 3 million in March 2006, but has declined since then. The short-term trends earlier in the decade are unclear. Overall, the number of undocumented immigrants from Latin American nations other than Mexico has risen since 2000, but the growth rate is smaller than for undocumented Mexicans and the pattern of year-to-year changes more erratic. 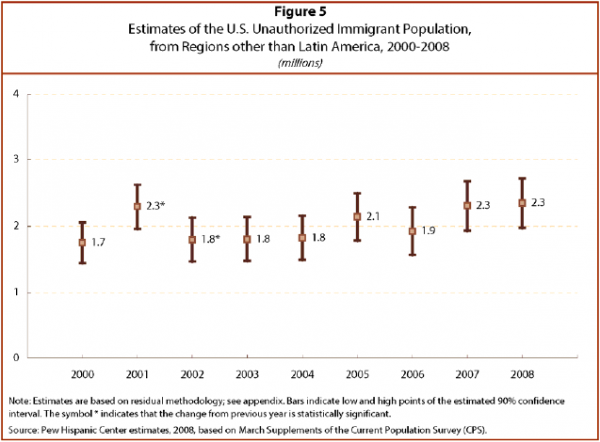 This recent decline is borne out by other Bureau of Labor Statistics data, cited in a recent annual Pew Hispanic Center report, indicating that the number of foreign-born South Americans in the U.S. workforce declined in the first quarter of 2008 compared with 2007. It appears that legal immigration from Latin American countries other than Mexico has been steady through the decade, while undocumented immigration has declined. That means that the composition of the immigration flow from these countries has changed this decade from majority undocumented to majority legal. The number of undocumented immigrants from nations outside Latin America may have risen somewhat since 2000 and leveled off since 2005, but most year-to-year changes are not statistically significant. In March 2008, the number of unauthorized immigrants from countries outside Latin America was estimated at 2.3 million—a figure significantly larger than the 1.7 million in 2000. Few of the year-to-year changes over the decade are statistically significant. It is difficult to determine a trend because this unauthorized population is relatively small compared with the legal population, which leads to a large margin of sampling error.